Fr. 2157m-K*. 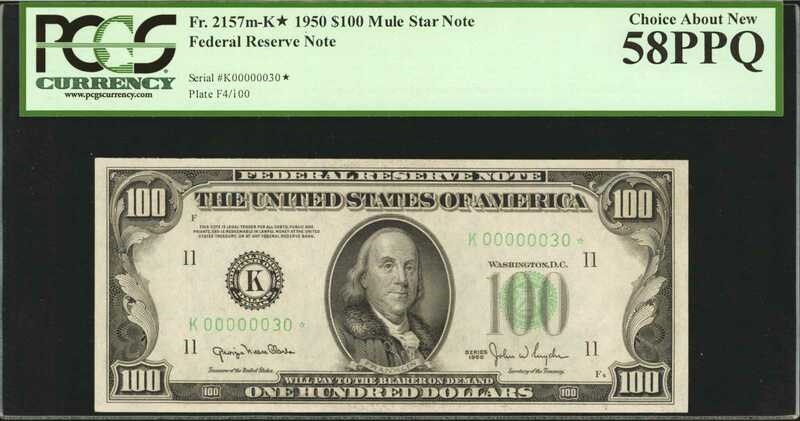 1950 Mule $100 Federal Reserve Star Note. Dallas. PCGS Currency Choice About New 58 PPQ.A rare $100 replacement note and even more so with grade. This piece is the finest PCGS has certified without equal and also sports a terrific two digit serial number of K00000030*. Perfectly original paper throughout and just a single center fold seen by us.